1. Cook the eggs in boiling water for 5 minutes, run under cold water then peel the eggs and cut into quarters. Simmer the asparagus tips until just tender then cool in cold water. 2. 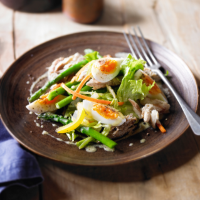 Meanwhile, break the mackerel into chunks and toss into the salad with the asparagus. Whisk the oil, vinegar and mustard together and toss into the salad. 3. Transfer to serving plates and top with the boiled eggs. This recipe was first published in Wed Aug 27 10:54:19 BST 2014.